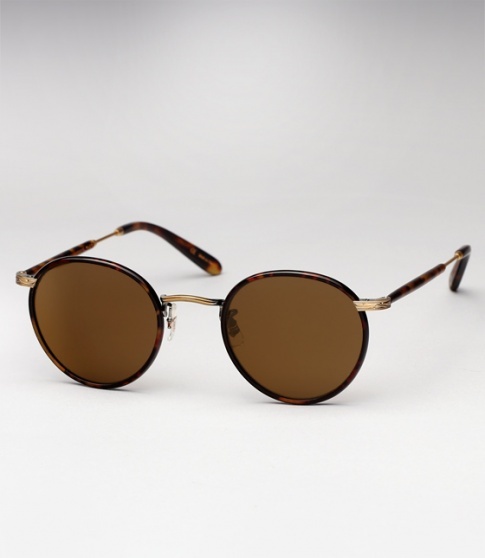 Garrett Leight Wilson - Bourbon Tortoise Need Help? Garrett Leight, the son of Oliver Peoples founder Larry Leight, has branched out to create a namesake brand of his own: Garrett Leight California Optical (GLCO for short). GLCO is laid back, sophisticated, and inspired by his California surroundings. There is a timeless aesthetic to the entire collection. It’s not over complicated, just perfectly executed classic 20th century American styles with a modern twist. Having come from an optical background gives Leight the unique ability to pay attention to the subtle details which makes any frame just that much better: such as the fit, proportion, and comfort. Each frame also boasts some great technical features. Keeping true to the original British classic design which inspired the frame, the Garrett Leight Wilson features authentic acetate Windsor rims, detailed metal filigree, mixed antiqued metal, and mineral glass lenses. It is offered here with a "Bourbon Tortoise" front and "Matte Spotted Tortoise" temples paired with "Pure Brown" glass lenses.